The Karoo Predator Project is glad to announce the publication of its new paper regarding the “wildlife winners and losers of entensive small-livestock farming in the Karoo”. Extensive farming is an important source of food and fibre and often the only viable land use in the more arid regions of the globe. Yet, land use transformation for livestock grazing can lead to natural habitat degradation and fragmentation, identified as the main threats to biodiversity worldwide. Understanding which species are “winners” (i.e. species with a higher relative abundance index on farmland than protected area) and “losers” (i.e. species that have been extirpated or have a lower relative abundance index on farmland) in farming landscapes is crucial for the global sustainability of food production and biodiversity conservation. We used camera traps across 332 locations, over 23,796 trap nights to compare species richness and several aspects of community diversity (evenness, dominance, functional diversity and community structure) on 22 extensive small-livestock farms and a nearby protected area in the semi-arid region of the Karoo, South Africa. Species richness was not significantly different between the two land uses, but there were important differences in community structure and composition. Large carnivores were the “losers” of extensive livestock farming. Farmland displayed a lower effective number of species and functional diversity and a higher dominance than the protected area. The latter had a positive influence on the presence of large mammals and on the relative abundance of the region’s main mesopredator, the black-backed jackal (Canis mesomelas). Contrary to consensus, extensive small-livestock farming may be beneficial to some species and may therefore represent an important opportunity for biodiversity conservation outside of formally protected areas. The Karoo Predator Project has also participated in a collaborative paper about the animal welfare considerations for using large carnivores and guardian dogs as vertebrate biocontrol tools against other animals, led by Benjamin L. Allen from the University of Southern Queensland, Australia and the Centre for Invasion Biology, South Africa. Introducing consumptive and non-consumptive effects into food webs can have profound effects on individuals, populations and communities. This knowledge has led to the deliberate use of predation and/or fear of predation as an emerging technique for controlling wildlife. Many now advocate for the intentional use of large carnivores and livestock guardian dogs as more desirable alternatives to traditional wildlife control approaches like fencing, shooting, trapping, or poisoning. However, there has been very little consideration of the animal welfare implications of deliberately using predation as a wildlife management tool. We assess the animal welfare impacts of using dingoes, leopards and guardian dogs as biocontrol tools against wildlife in Australia and South Africa following the ‘Five Domains’ model commonly used to assess other wildlife management tools. Application of this model indicates that large carnivores and guardian dogs cause considerable lethal and non-lethal animal welfare impacts to the individual animals they are intended to control. These impacts are likely similar across different predator-prey systems, but are dependent on specific predator-prey combinations; combinations that result in short chases and quick kills will be rated as less harmful than those that result in long chases and protracted kills. Moreover, these impacts are typically rated greater than those caused by traditional wildlife control techniques. The intentional lethal and non-lethal harms caused by large carnivores and guardian dogs should not be ignored or dismissively assumed to be negligible. A greater understanding of the impacts they impose would benefit from empirical studies of the animal welfare outcomes arising from their use in different contexts. 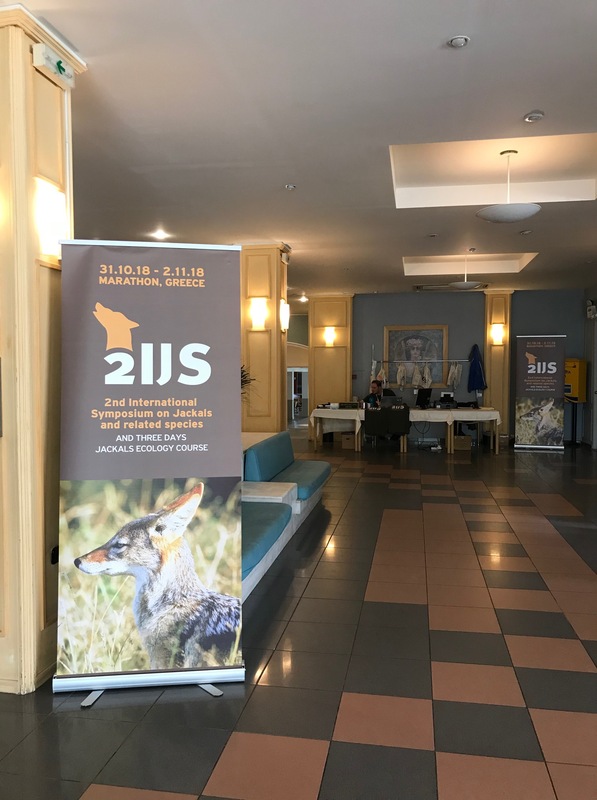 From the 31st of October to the 2nd of November, the Second International Jackal Symposium (2IJS) was taking place in Marathon Bay, Greece. 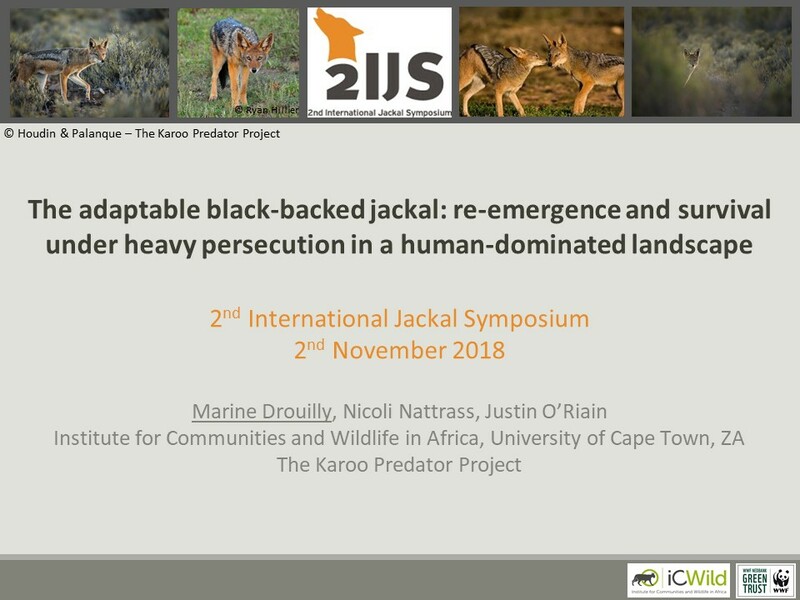 A great opportunity for both Marine and Nicoli to present their research on jackals. Marine gave a presentation about some of her PhD work based on the questionnaires she conducted with farmers. She talked about the re-emergence of black-backed jackals in the Central Karoo, farmers’ attitudes towards jackals and their strategies to limit their predation on livestock. Nicoli talked about her paper on the jackal narratives, livestock losses due to jackals and the use of poison on farmland. Entrance to the conference hall in Marathon Bay, Greece. 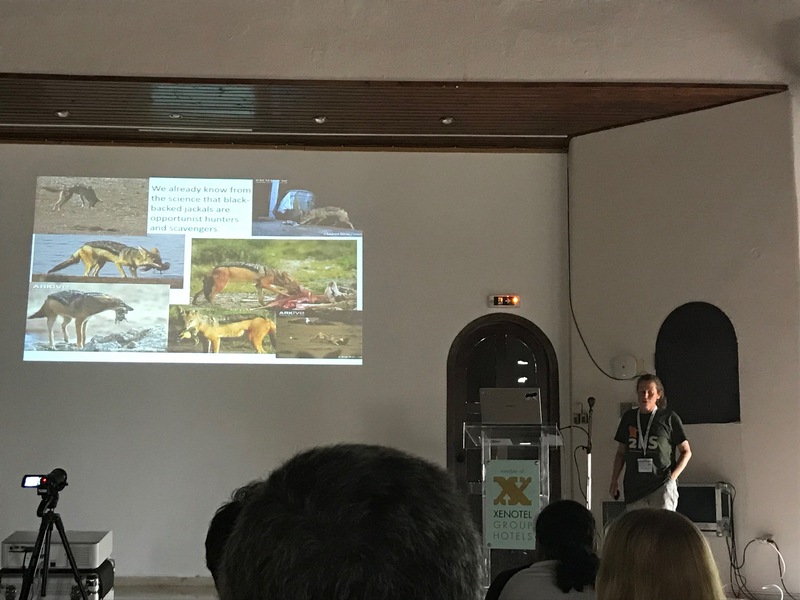 The conference gathered researchers from Europe, India, Australia, North America and Africa and the subjects were very diverse: from taxonomy and sustainable hunting to scientific monitoring of jackals. Seven species were highlighted during this conference: the golden jackal (Canis aureus), the side-striped jackal (Canis adustus), the black-backed jackal (Canis mesomelas), the coyote (Canis latrans), the African wolf (Canis anthus), the Indian wolf (Canis lupus pallipes) and the most endangered canid species in the world, the Ethiopian wolf (Canis simensis). The conference edited a book with the scientific papers of the participating scientists, available here. Nicoli giving her talk “What does science and history tell us about black-backed jackals and their conflict with sheep farmers in South Africa? ” at the 2IJS. Marine’s presentation at the 2IJS in Greece. The Karoo Predator Project is happy to announce the publication of its recent research in a special issue (“Karoo Special Issue: Trajectories of Change in the Anthropocene”) of the African Journal of Range and Forage Science, titled “Spatial, temporal and attitudinal dimensions of conflict between predators and small-livestock farmers in the Central Karoo”. The paper, written by Marine, Marion, Nicoli and Justin, uses some of the questionnaire data collected by Marine in 2014 and 2015 during the interviews she conducted with small-livestock farmers in the Central Karoo. The paper can be downloaded from this page (restricted access) or be sent upon request. The abstract of the paper can be found below. Conflict between predators and small-livestock farmers is a global phenomenon adversely impacting the preservation of wildlife, the well-being of livestock and human livelihoods. Such conflict is pervasive in the Karoo region of South Africa but its contemporary history and various causes remain poorly understood. In this study, we interviewed 77 small-livestock farmers in the Central Karoo between July 2014 and March 2015 to (1) assess the spatio-temporal distribution and severity of the reported predation problems with the main regional predators of livestock (black-backed jackal, caracal and baboon) and (2) describe the perceived reasons for changes in predator numbers. Farmers reported that serious predation problems have increased since the 1990s for all three predators. Jackal predation appears to have re-emerged, particularly since the 2000s, while baboon predation seems to have escalated rapidly since 2014 for select farmers. Farms with more rugged terrain were more likely to experience serious problems with baboons and caracal but ruggedness did not predict the year of onset of problems. Farmers perceive predator numbers to be increasing and attribute this trend to declining government support for predator management, changes in farming practices and the associated increase in suitable predator habitat, from which they can recolonise commercial farms. 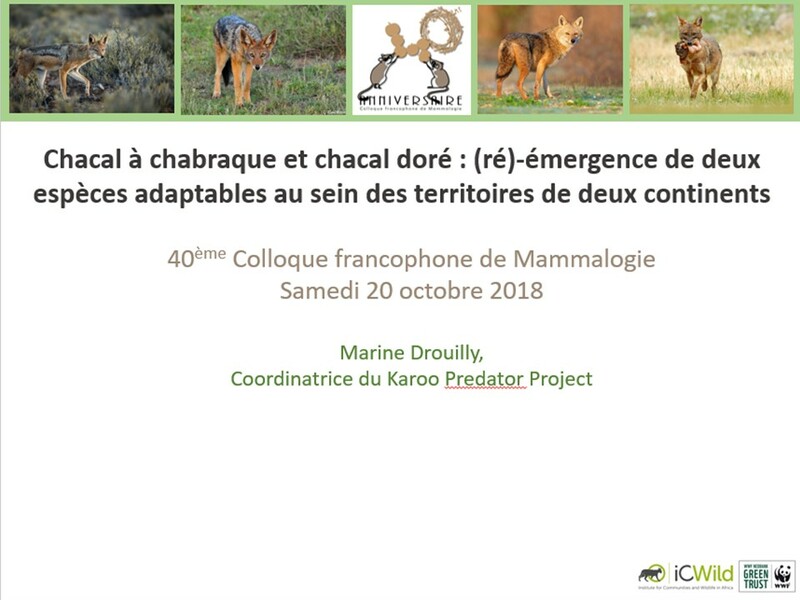 On the 20th of October, Marine was invited to talk about the Eurasian lynx at the 40th French Mammalogical Conference in the town of Caen (western France). It was also the opportunity for her to give another presentation, this time about some of her PhD work on jackals. And because the conference was in Europe, she also spoke about golden jackals. She drew a parallel between the re-emergence of black-backed jackals in the Karoo (more about that in a future post) and the expansion of golden jackals across Europe. She started by showing the incredible ecological flexibility of both species. She then demonstrated that anthropogenic factors were the reasons for the fall in jackal numbers in both areas (mostly due to hunting and poisoning campaigns) and that the reasons for the re-emergence and expansion of both species were probably to be found in the synergy of different factors, from the probable diminution/extirpation of large carnivores, notably grey wolves for golden jackals, and lions and leopards for black-backed jackals (i.e. mesopredator release), to the change in land use in each area, the ending of large-scale legal poisoning campaigns and bounty hunting, and the change in the legal status of the two species, as well as a more positive public opinion towards the canids. The presentation was also a good opportunity to discuss with the audience about the first golden jackal presence records in France (2017) and the likelihood for the species to permanently settle in. We are glad to announce the publication of our recent collaborative research paper with the Center for Ecological Genomics and Wildlife Conservation at the University of Johannesburg. The paper was writen by Dr. Laura Tensen, Marine Drouilly and Prof. Bettine van Vuuren, and was published in the Journal of Mammalogy. You can download the paper on that page. The abstract of the paper is presented below. Jackals (Canis mesomelas) and caracals (Caracal caracal) are considered major predators of small livestock on farms across South Africa, with both species being subjected to lethal control. Lethal management (i.e., culling) can result in differential responses in the population dynamics and demography of mesopredators. We examined the potential impacts that high population turnover, due to lethal management, may have on the genetic structure and diversity of jackal and caracal populations. We included mitochondrial markers to assess the movement of maternal lineages across the landscape as a proxy for dispersal. We further employed variable microsatellite markers to quantify levels of genetic diversity and relatedness among individuals. We found that high population turnover in both species may promote compensatory dispersal, which is consistent with the high levels of genetic diversity observed in both species. Structure analysis showed that the jackal population was comprised of 2 genetic clusters, while all the caracals belonged to a single nuclear genetic cluster. The weak differentiation between the jackal clusters (FST = 0.08), and the high level of inbreeding (FIS = 0.112) in the Central Karoo cluster, suggests that they likely represent demic populations. These data can be used as a baseline for ongoing population monitoring. Temporal monitoring of wildlife populations that are exposed to lethal management is important for a better understanding of the long-term effects on species ecology and survival success. Last week, Marion and Marine drove up to the Central Karoo to give a final feedback on the results of their research to the farmers and other interested parties. Nelmarié Saayman from the Department of Agriculture – Western Cape Government also gave a presentation on the veld condition of the Gamka Karoo vegetation type in the Central Karoo, in terms of vegetation and soil erosion potential in two rainfall zones. This meeting was an opportunity to see the farmers again and other stakeholders who have been involved in the Karoo Predator Project, and to discuss the results of Marine’s PhD together. It was also the opportunity to thank all the people who participated in the success of the project. Even if the Karoo Predator Project is drawing to an end, results will keep being published in peer-reviewed scientific journals and in magazines for the general public. UCT is also involved with more ecological research around the SKA in the Northern Cape Karoo. Watch this space for our work that has just been accepted in peer-reviewed scientific journals and that we will share with you soon. 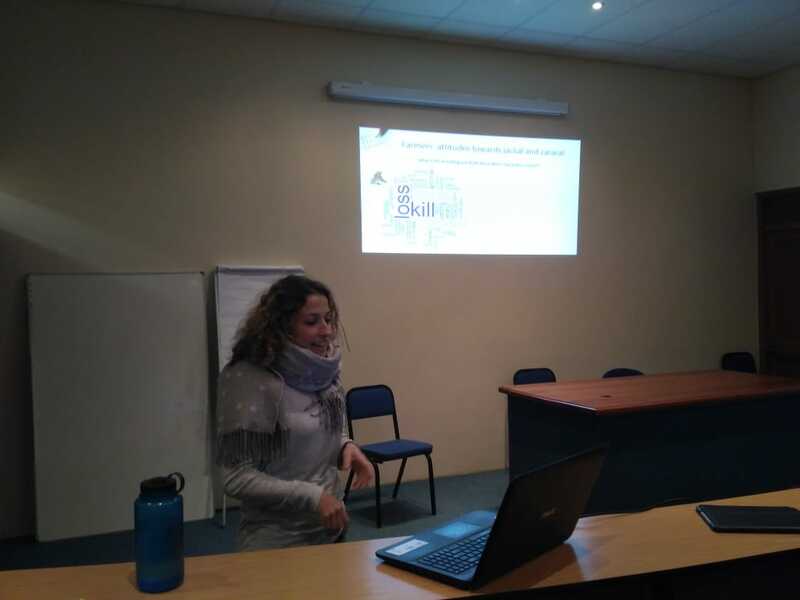 Marine presenting a summary of all the results from her PhD to the farmers and interested parties in Laingsburg, Central Karoo. I am happy to share with you that we have published a new paper in the international journal Biological Conservation and titled “Multi-species occupancy modelling of mammal and ground bird communities in rangeland in the Karoo: A case for dryland systems globally”.